Help! I'm stuck under a rock! trange — I didn't think I'd downloaded Nintendo's Pikmin. Luckily for Swedish developer Ludosity Interactive, any similarity between Miyamoto's pseudo-RTS masterpiece and their latest project, Bob Came in Pieces, ends with the game's opening story sequence. Then again, perhaps Bob would have played a bit more smoothly had the developer taken a few design cues from Mario's father. Environmental puzzles define Bob Came in Pieces — Bob is a wayward alien who's trying to leave the strange world upon which he's crashed. Players scour the surface, acquiring the new parts and equipment that will enable them to overcome a variety of obstacles. Thy physics which control your spaceship are a tad wonky.In terms of its puzzles, Bob proves to be quite refreshing. While never becoming too difficult, there's very little "hand holding" for the player after the game's first level or two. Players will have to do a good deal of experimentation as they outfit their spacecraft with the kit that's required to make it past each level's conundrums. While never straying too far from the "move this, raise that" formula of puzzle/adventure gaming, there were a handful of puzzles that felt truly inspired. Spaceship customization runs the gamut, from structural modifications (armatures, extensions and pylons) to new tools like tractor beams and retro rockets. The combinations are absolutely staggering, and rarely is there a single solution for advancement. Design changes can be made on the fly at each level's myriad checkpoints — save favorite configurations for later reference and shift parts around to your heart's content. While Bob Came in Pieces may sound like a decent proposition so far, the game isn't without its faults. Sadly, the physics that control your spacecraft are a tad wonky (to say the least). Even when you carefully consider stability as you place your rocket thrusters on your spacecraft, it's all too easy to veer off course. 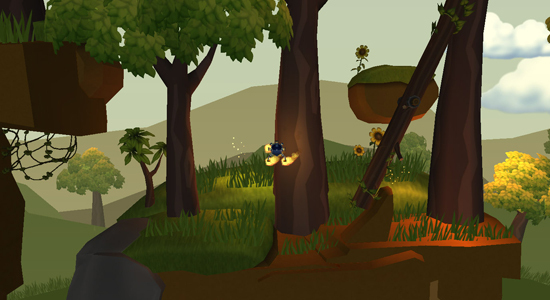 There are countless spots in each level where careless flying will find you tangled up in the environment. The ‘enter' key will send your ship back to the last checkpoint, a feature you'll find yourself using far too often. It's almost as if the designers knew the physics in their game were flawed and decided to include this reset button to appease players. I would have far preferred responsive controls and a more forgiving physics engine — these shortcomings are a real letdown, especially considering the charm that exists in the game's puzzle design. Fans of puzzle and adventure games looking for a new fix may want to give Bob Came in Pieces a look, even if only to experience a few really innovative level designs. Still, it's hard to overlook the game's bungled physics engine and derivative story — most will have a hard time looking past the rather plain presentation, and the rest will find themselves hopelessly stuck under a rock.